Got back from Korea on Tuesday. Can't seem to get my sleep schedule back on track. I'm all over the place. My trip turned out to be really fun and productive. I met a lot of great new friends which is my favorite part of traveling abroad. The crew in Korea is very psyched and truly a pleasure to climb with. The video First Ascents in Korea got a good reaction when played at the Reel Rock Tour event in Seoul. Local Koreans were excited by the development being done in the Busan area. Before I left I got to help develop some brand new boulders in the Hadan Area. Thanks to Aaron Hefty and Robin Kimmerling for opening the door for me. This area was a short walk from Brenna and Christoph's houses. The rock quality was amazing and it seemed like that mountain could hold more potential. I managed to put up a few good first ascents there which include The Hadan Shuffle v2, Thorn Killer v5, Thorn Killer Traverse v7?, Fruit of the Vine v3, and Vine and Dine v3. These problems were all awesome additions to Busan. I left behind a few open projects for the locals to send. One around the corner from Thorn Killer is on the highball boulder and goes up a tall face via hard moves on sharp crimps; wouldn't be surprised if it's about v7. 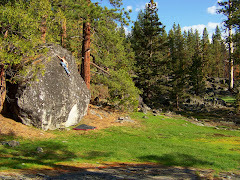 The other is my obvious dyno project on the Vine boulder uphill near the crag. Last I saw Matt Palmer was getting very close to sending. I feel like all in all, I did not really touch the surface of the amount of bouldering that could be in Korea. I have a feeling that Seoul may have more developed areas that are bigger. Busan, however, is the new place with lots of potential to be discovered. The area I was most impressed with was Yangsan. Yangsan has perfect rock in an amazing asianesque setting. With Hangul characters etched into the boulders, temples on the approach, this was definitely my favorite. My favorite line there was Listo el Pollo v9. I got the second ascent after Christoph Lindenberger. The line was very unique movement, uncontrived, and on perfect river stone. Truthfully most of my time in Korea was spent training on plastic. Something I've fallen behind in the past few years. It was nice to make an effort to get better and to feel the ability to pull through holds using pure power. The gyms I went to were just what I needed for good training. I found it hard to keep up with local talent, but they are kind of machine like in their abilities to just crush plastic climbing rather quickly. I was inspired by their raw power. Thanks a lot to Young Wha Kim of Family center for helping me train on a bunch of climbs I could never do. And thanks to the other Mr. Kim of Hadan Industrial Wall for letting me train at his facility. Now I am back in the Sierras trying to get my bearings for the next 6 months. I am leaving for Bishop tomorrow for New Years and plan on hanging down there for a bit before going on to Moe's Valley, UT and going to check out all the awesome bouldering around Las Vegas. If things work out I may go a bit further than that. So many problems that I want to do this winter. I am very excited to see if all of my hard work training will pay off. In the least I am going to have a great time. I hope everyone has a great New Year's.